Before reading this article, readers are advised to read the main article Arjuna's Military Campaign for Rajasua, that describes the entire journey of Arjuna for his military campaigns to the territories that lied to the north of Indraprastha. This article describes Arjuna's military campaigns in the territory in and around the Trigarta kingdom. The regions covered by Arjuna, mostly falls in the Punjab state of India and partially in Himachal_Pradesh and Jammu_and_Kashmir states and the immediate neighborhood (of Punjab and J&K) in Pakistan. Arjuna subdued Bhagadatta in Pragjyotisha (see Arjuna in Pragjyotisha) through peaceful means and extracted tribute from him and the kings under his sway. These territories lied mostly in Himachal_Pradesh. From there Arjuna moved to Uluka territory in Punjab. Mbh.2.26:- Vrihanta, however, quickly coming out of his city followed by his army consisting of four kinds of troops, gave battle to Arjuna. And the fight that took place between Vrihanta and Dhananjaya was terrible. It so happened that Vrihanta was unable to bear the prowess of Arjuna. Then that invincible king of the mountainous region approached him with all his wealth. Uluka territory mentioned here seems to be Ludhiyana districts of Punjab, to the south of Satadru (Sutluj). Ludhiyana have a considerable population of Aulak tribe, considered to be descendants of Ulukas. The territory seems to extend along the southern shore of Satadru (Sutluj) river into Faridkot and Firozpur districts of Punjab westwards as well as to Rupnagar district to the east. There is a village named Aulak in Rupnagar. Uluka was not within the power of Bhagadatta but was allied to Trigarta kingdom of Punjab. Hence the king of Uluka gave a fierce fight to Arjuna and was finally defeated. After this, Arjuna would have wanted to attack Trigarta capital Prasthala lying north to Ukuka territories but might have faced tough resistance of Trigarta forces. Hence, from Uluka territory he marched to Devaprastha ruled by king Senavindu in the east, instead. Mbh.2.26:- Arjuna snatched out the kingdom from Vrihanta, but having made peace with him marched, accompanied by that king, against Senavindu whom he soon expelled from his kingdom. After this he subjugated Modapura, Vamadeva, Sudaman, Susankula, the Northern Ulukas, and the kings of those countries and peoples. Hereafter at the command of Yudhishthira, Arjuna, did not move from the city of Senavindu but sent his troops only and brought under his sway those five countries and peoples. For Arjuna, having arrived at Devaprastha, the city of Senavindu, took up his quarters there with his army consisting of four kinds of forces. There is a place named Seoni in Shimla district on the banks of river Satadru. This name is indicative of Senavindu. However it was the name of the king and the name of Sanavindu's capital was Devaprastha. There is also a village named Deo, 88 km from Kandaghat in Solon_district in Himachal-Pradesh which is another candidate for Devaprastha. Devaprastha (Deva:- god, the tribe of Devas; prastha:-place, town, city) means the city of the Devas. Deo means Deva. After defeating king Senavindu of Devaprastha, Arjuna stationed there with his army at the command of Yudhisthira. This was because Arjuna was close to the Trigarta capital territory viz. Prasthala. Trigartas were an ally of the Kauravas and king Duryodhana. Trigartas had planed to assemble a large army and attack Arjuna. He send troops to the five territories that lied surrounding Trigarta in the east and north, viz. the Modapura city, the territories ruled by kings named Vamadeva, Sudaman and Susankula and finally the northern-Ulukas. Arjuna was actually surrounding the Trigartas, to take them last. This city is not yet identified but could lie east of Trigarta (centered around Prasthala i.e. Jalandhar), their capital, and north of Devaprastha. Arjuna's forces defeated this city while Arjuna stayed at Devaprastha. These territories lied surrounding Prasthala, to its east and to the north of Devaprastha and Modapura. After defeating these territories Arjuna's forces reached Northern Uluka that lied to the north of the Trigartas ruling at Prasthala. Arjuna stayed at Devaprastha, while Arjuna's forces defeated Northern Uluka. Northern Uluka is identified to be Amritsar, Gurdaspur districts of Punjab, especially the regions that lied to the south of Iravati (Ravi_River) river. This region contains considerable number of Aulakh population, considered to be descendants of Northern Ulukas. The town Anjala in Amritsar district to the south of Iravati (Ravi_River) seems to be their capital. After sacking Northern Uluka, Arjuna's forces might have retreated due to resistance from Prasthala, the capital of Trigartas. They would then join Arjuna at Devaprastha. Mbh.2.26:- Thence, surrounded by the kings and the peoples he had subjugated, Arjuna marched against king Viswagaswa, that bull of Puru's race. Having vanquished in battle the brave mountaineers, who were all great warriors, the son of Pandu, then occupied with the help of his troops, the town protected by the Puru king. Arjuna marched northward from Devaprastha and reached the Puru city. From the narration it seems this town lied in the mountains. The location of Puru king's territories is not identified clearly. During the time of Alexanders invasion (326 BC) he encountered a Puru king (Paurava tribe) named Pururava (King_Porus). 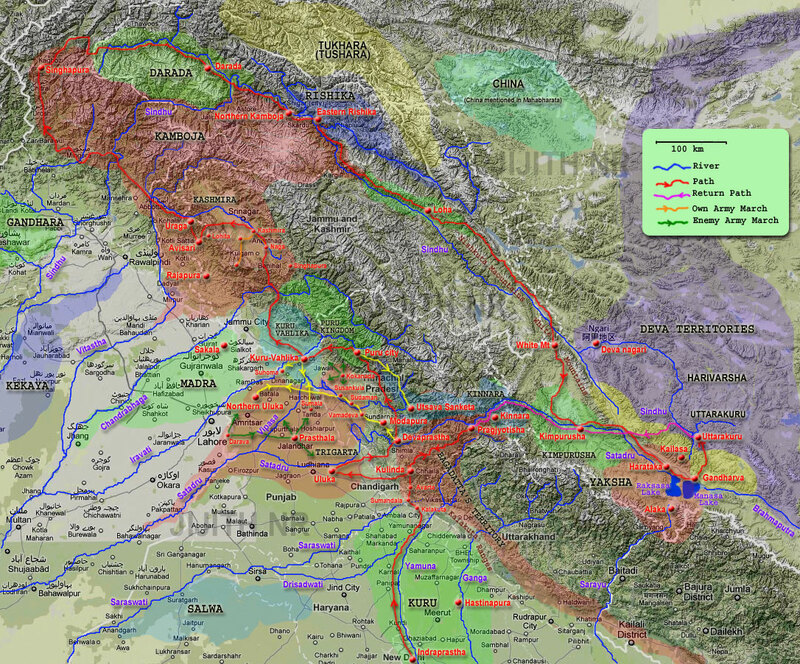 Porus had his territory between Vitasta (Jhelum, Hydaspes) and Chadrabhaga (Chenab, Acesines or Asikni). It however had an extension upto Vipasa (Beas_River, Hyphasis). Porus was also known as Parvataka, indicating that he ruled mountainous (Parvata) territories. During the period of Rig Veda, they were mentioned as living close to Iravati (Parushni, Ravi_River) in Punjab (as per Rig Vedic verses). During the military expedition of Arjuna, the Puru king Viwagaswa's territories probably lied close to the Utsava-Sanketa territories. Thus we can assume this territory lied between Beas and Ravi rivers, to the north of Utsava-Sanketra territories. Arjuna took with him the forces of the kings and peoples he had subjugated and attacked Puru king Viswagaswa and defeated him. In the Rig Vedic battle of the ten-kings, the Bharatas fought against the Purus. As per Mahabharata genealogy of kings, the Kurus including the Pandavas (the tribe of Arjuna) were all belonged to the Bharata tribe. In this case, the battle of Arjuna against the Puru king resembled the ancient battle of the Purus and the Bharatas mentioned in Rig Veda. Mahabharata also considers the Bharatas to be a branch of the Purus. After defeating the Puru king, Arjuna stayed at the city of Puru occupying it till his next movement. Meanwhile he brought the Utsava-Sanketa tribe to the south of the Puru territory under his sway by sending his forces. Mbh.2.26:- Having vanquished in battle the Puru king, as also the robber tribes, of the mountains, the son of Pandu brought under his sway the seven tribes called Utsava-sanketa. The seven tribes of Utsava Sanketa were identified to be seven Kinnara tribes who occupied hilly regions in western Himachal Pradesh. They were spread from Kangra in the north to Rampur-Busher in Shimla in the south. Thus they were spread between Vipasa (Beas_River) and Satadru (Sutluj_River). These tribes had the custom of getting united in marriage (Sanketa) during a grand festival (Utsava) occurring once a year. Arjuna probably stayed at the Puru city and brought Utsava-Sanketa's under his sway by sending his forces. Knowing that Arjuna had defeated the formidable Puru king, these Kinnara tribes might have readily accepted his sway. They were also under the influence of Bhagadatta, who ruled Kinnara tribes who had already offered his support to the cause of Arjuna's military campaign. Mbh.2.26:- Then Arjuna, at the head of all his troops, fiercely attacked the regions called Suhma and Sumala. Arjuna, after pressing them with great force, brought the Valhikas always difficult of being vanquished, under his sway. From the Puru city, Arjuna moved to the territories of Kuru-Vahlikas who had some remote kinship with Arjuna. This territory lied to the north of Trigarta capital territory viz. Prasthala (Jalandhar) and to the south of Kamboja capital territory viz. Rajapura (Rajauri). Suhma was a region that lied close to or within the Kuru-Vahlika territory in northern Punjab (India). It lied adjacent to the Sumala region. It is not accurately identified yet. This region need not be confused with the Suhma kingom in southern West Bengal. The name Suhma, in this context, seems to be a corruption of the name Suhoma or Susoma (Su = good; Soma = the moon, the soma-plant). This was formerly the place of the Soma drinkers (the Deva tribe) who later moved to Manasarovara in Tibet along Sindhu (Indus), Satadru (Sutluj) and Saraswati. This is mentioned in Rig Veda. Suhma or Susoma lied close to the Rig Vedic river Parushni (Iravati of Mahabharata-era, now known as [wikiepdia:Ravi_River]). Sumala seems to be a region that lied close to the Kuru-Vahlika territory in northern Punjab (India). There is a village named Pandori Sumala in the block Bhunga in district Hoshiarpur of Punjab state (India). It lied along the Hoshiarpur-Dausa road. This name is indicative of the ancient Sumala region. From Sumala, Arjuna's forces might have tried to attack Prasthala again only to be checked by stiff resistance from Trigarta forces. Vahlikas (Kuru Vahlikas) were a Vahlika tribe allied to the Kuru tribe in which Arjuna belonged. Arjuna is not mentioned to have battled against the Vahlikas but brought them under his sway probably by diplomacy. The Kuru-Bahlika king Somadatta and his son Bhurisravas were supportive of the Pandavas and often criticized the acts of Duryodhana, though they took part in the Kurukshetra War opposing the Pandavas. Their territory roughly lied in the northern Punjab comprising Gurudaspur and Hoshiarpur the districts. The place names like Bahla indicate this. There is also a town named Salapur indicative of the city of Sala, one of the sons or grandsons of Kuru-Bahlika king Somadatta. The city of Balkh in northern Afganistan is usually identified with Bahlika. However this seems to be a settlement of Bahlika people in their migration to western lands, much like the migration of the Pragjyotishas to eastern lands like Assam. The people of Kuru-Panchala countries had considered all the tribes beyond (especially in the north west of) Trigarta collectively as Bahlikas (outsiders). This included Madra (Sialkote) too that lied to the west of Trigarta. This fact also strengthens the case of Kuru-Bahlika territory being in northern Punjab. From the Kuru-Vahlika territory Arjuna marched further north to reach the regions under the control of the Kamboja tribe. These territories roughly lied in Jammu & Kashmir territory. Mbh.2.26:- Then the Trigartas, the Daravas, the Kokonadas, and various other Kshatriyas, advanced against Arjuna. Arjuna thus attacked the kings who ruled the territories or cities that lied adjacent to the southern, eastern and northern boundaries of Trigarta capital Prasthala, making it vulnerable. Trigartas too were not sitting idle but gathering an army to attack Arjuna. They took the help of their allied tribes viz. the Daravas and Kokanandas. The combined army of these tribes attacked Arjuna. The objective of the attack was to prevent Arjuna from getting closer to the Trigarta capital Prasthala. Trigarta attack would be stronger when he was at the territories close to Prasthala like Uluka, Northern Uluka, Sumala and Kuru-Vahlika. Arjuna defeated them all but could not conquer Prasthala, the capital of the Trigartas. He instead continued his march towards the north. Trigarta was the region defined by the three rivers viz. Iravati (Ravi_River), Vipasa (Beas_River) and Satadru (Sutluj_River). Its capital Prasthala (Jalandhar) lied between Vipasa and Satadru. The region between Vipasa and Satadru was the stronghold of Trigarta. Uluka lied to is south of Satadru and Northern Uluka to the north of Vipasa. Both of these territories were however under the power of Trigarta kings at Prasthala, though ruled by independent kings. The tribe of Daravas were a nomadic tribe. They settled in the western outskirts of Trigarta, during the time of Mahabharata. This was close to Lahore city in Pakistan. Daravas moved westwards subsequently. They were a sub-sect or branch of the Romani_people who migrated from India to Europe, not in 250 BCE but much earlier like in 1000 BCE. During the time of Mahabharata, they lived subordinate to Trigarta power, in Trigarta territories. Darava army joined the Trigarta military in attacking [[[Arjuna]]. Daravas could have caused disturbance to Arjuna's military movements at Northern-Uluka. Kokanada is the name of a type of red water lily. The word nada in Kokanada indicates river. Probably the tribe of Kokanadas lived in or around Punjab, near some river where red water lilies are seen plenty. There is a village named Koka in Kangra, 2 km north of Kangra on NH-20, between Gaggal and Mataur. This is a candidate for Kokanada. There are lakes close to Vipasa river where the red water lilies (Kokanadas) can grow. Kokanadas thus lived north of Vipasa (Beas) in Kangra district of Himachal Pradesh. Kokanada's could have caused disturbance to Arjuna's military movements from Puru city to Vahlika territory.